We’d love your help. 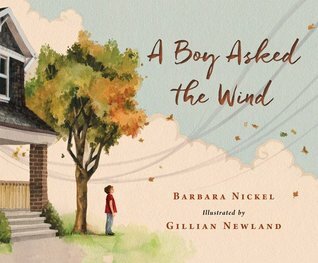 Let us know what’s wrong with this preview of A Boy Asked the Wind by Barbara Nickel. A spectacular picture book, with text in subtly linked beautifully composed four-line stanzas, evoking winds around the world, including those in the Canadian west, off the coast of Central America, Capetown, and the Middle East. Illustrations are muscular, organic, powerful evocations of the power of those winds. To ask other readers questions about A Boy Asked the Wind, please sign up. The ideas is good, but I was'nt impressed by the rhyming text. The pictures aren't that special, either. Told in verse, we follow the wind as it blows all over the world. In many places the wind is affected by geography and climate and has different names. This beautifully illustrated book can be interpreted in many ways: as poetry, science, art and social studies. Inquiring minds ages eight to adult will enjoy this story. The illustrations are good but the poetry isn't very lyrical.